The number of blockchain jobs has peaked last year, growing 207% since 2016, and continues to increase, according to the report by Indeed.com. 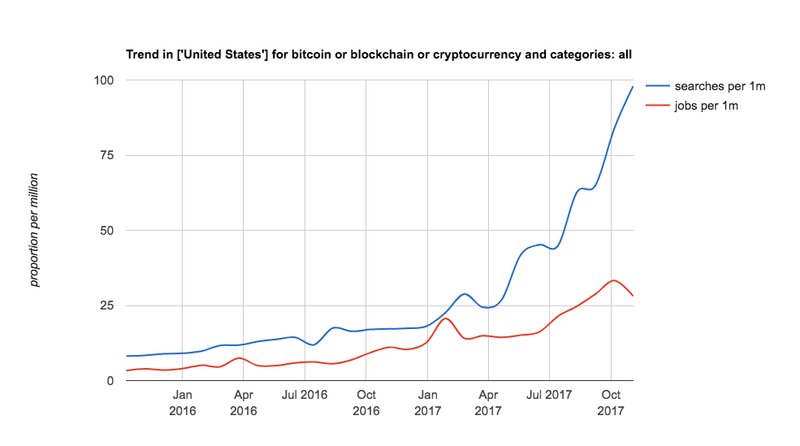 Still, the number of blockchain engineers is relatively low. As a result, hiring a skilled and experienced developer can be similar to finding a needle in a haystack. Moreover, there are lots of fake experts in blockchain technology, just like scam blockchain startups. The existing talent gap, together with the growing demand for specialists, set certain challenges for businesses looking to hire blockchain developers. These include high blockchain developer rates as well as fierce competition for the top talent. So, if you want to know how to find developers for your project and attract the best talent, you need to employ all available means. First, you need to know where to find blockchain developer for hire. Whether you are looking to grow your in-house staff, hire blockchain developer on a freelance basis, or contract a consulting firm, here are several ideas to kickstart your search. Just like other software engineers, blockchain developers for hire can be found on various freelance platforms. 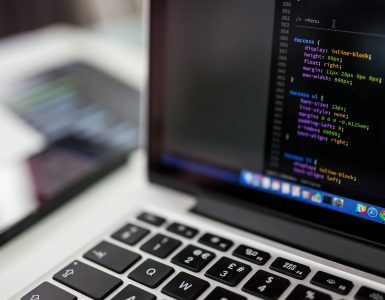 Upwork.com and Toptal are the most popular platforms with a large talent pool, where you can find and hire the best blockchain developer for your project. DREAM is a marketplace dedicated solely to connecting businesses with hand-picked freelance blockchain developers (they accept only 6% of all applications submitted). The platform allows both hourly and fixed-price projects of different scale and duration. As for the cost, there is a 10% platform fee incorporated into the freelancer rates. 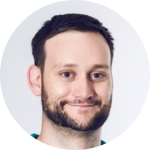 Codementor.io is a developer community rather than a freelance marketplace. The platform offers risk-free trial and rapid hiring process thanks to their dedicated hiring consultants. There are also no additional fees for employers (platform fee is already included into the freelance rates). Yet the website they currently lists only about 50 blockchain experts, as opposed to 250,000+ developers in general. Xbtfreelancer.com is a freelance marketplace with a 100% focus on all things blockchain. The website has a very detailed skill filtering capabilities and accepts payments in bitcoin. It also boasts a massive pool of 61,818 freelancers (although not all of them are developers). Posting a project on the website is free, however, the platform adds a 60¢ fee to each transaction to support the Bitcoin network. Despite being relatively easy to find and hire, freelance developers pose additional challenges for business owners. For example, managing freelancers can be tricky if you don’t have enough experience. Plus, hiring blockchain developer on a freelance basis only makes sense if you have a short-term project. How to recruit in-house engineers? In case you want to build something more complex you should be looking to add blockchain software developers to your in-house team. Here are some websites for listing blockchain developers jobs (remote as well as local). Popular platforms, such as indeed.com or jooble.org are not specialized in blockchain developer jobs, yet they have good traffic. Placing relevant keywords with your blockchain developer job description can help you put your posting on the candidates’ radar. Moreover, there are dozens of small job aggregators that fetch job ads placed on these platforms and repost them. While both indeed.com and jooble.org work worldwide, you can also consider local job boards which are more popular in your country. For example, reed.co.uk is a great opportunity to reach tech specialists in the UK. 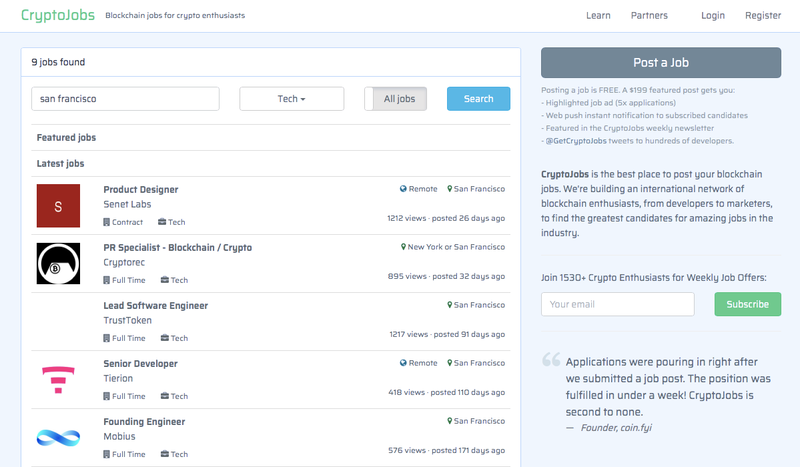 Crypto.jobs also offers multiple hiring options. e.g. remote/on-site, contract/part-time/internship. Plus, you can offer equity as a part of your benefits package. You can post a job ad for free or choose to feature your posting for $199. The platforms also runs a weekly newsletter sending featured job offers to its 1530 subscribers. Cryptojobslist.com. 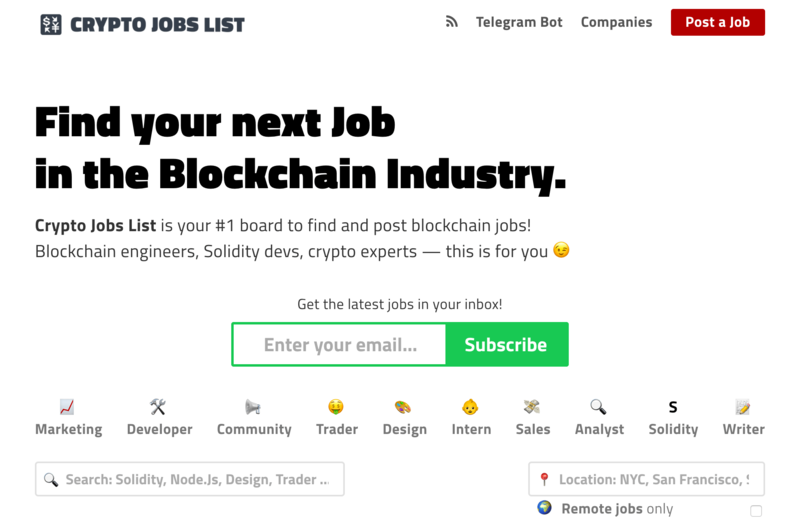 The website accepts job postings across a number of categories related to blockchain, such as engineering, marketing, trading, sales, design, etc. The resource has a handy Telegram bot that will deliver job postings directly to the potential candidates. The job posting will cost you $99 or $199 depending on the plan you choose. On blocktribe.com, both employers and applicants can register and create searchable profiles. Each job posting also specifies the actual use of blockchain for every position posted (e.g. blockchain centric business, blockchain project, services, etc.). You can post up to 10 job ads for free as well as choose from two premium options: £49 monthly package or £1,849 annual subscription. 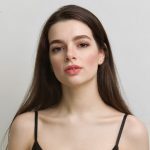 Beincrypto.com is a blockchain job aggregator. Unlike the above-mentioned job boards, it only offers paid options (the price is $149 for a job ad). However, the job postings are frequently updated: they add on average 20 jobs every day. Coinality is one of the oldest job boards for the blockchain industry and has current listings for freelance, part-time and full-time positions. All submitted jobs are reviewed by humans of reasonably sound judgment to ensure that all jobs posted on Coinality are real opportunities. BountyOne is a crypto freelancing and crowdsourcing smart contract marketplace developed by Blockgeeks. It allows connecting employers (primary blockchain companies) and freelancers globally who want to be paid in tokens and crypto. The locations of current jobs available are London, Toronto, San Francisco, etc. Remote is also an option. Popular community platforms, like Reddit or StackExchange, feature a number of niche groups dedicated to blockchain, bitcoin, ethereum, etc. Using these platforms, you can advertise your job opening directly to the potential candidates. 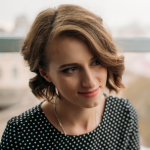 Although most of them might not be actively looking for a job, it is still an effective way to get visibility and connect with top blockchain software developers. Evan Faggart, Senior Editor of Bitsonline shared with us a subreddit where employers can list job openings, and prospective workers can market their skills to employers looking for new hires. Various networking events can also represent a great recruiting opportunity. You can collect contacts and pre-screen potential candidates in person, as well as see them in action (as at hackathons). 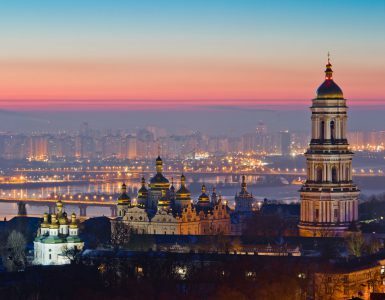 Blockchain Expo Global is the leading global established blockchain for business event, bringing together industry leaders for two days of world-class content from leading brands. BlockShow Europe 2018 is a major International Event for Showcasing Blockchain Solutions. The North American Bitcoin Conference is the largest blockchain industry conference in the world, as well as one of the first ones. Coinagenda is a major US conference that has started branching out into international events. 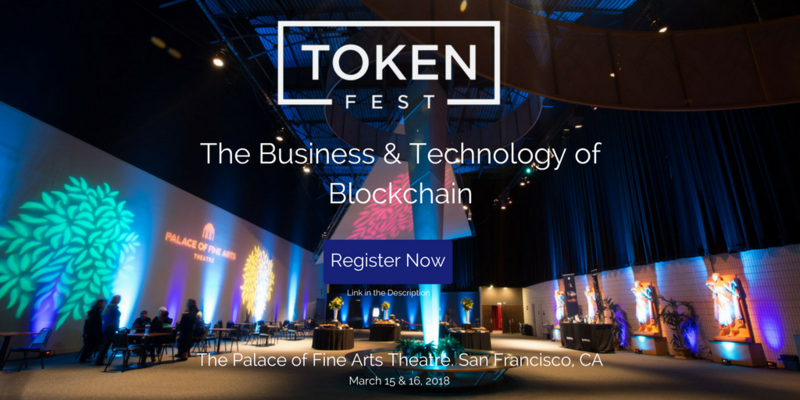 TokenFest is an exclusive, two day networking event focused on the business and technology of tokenization. 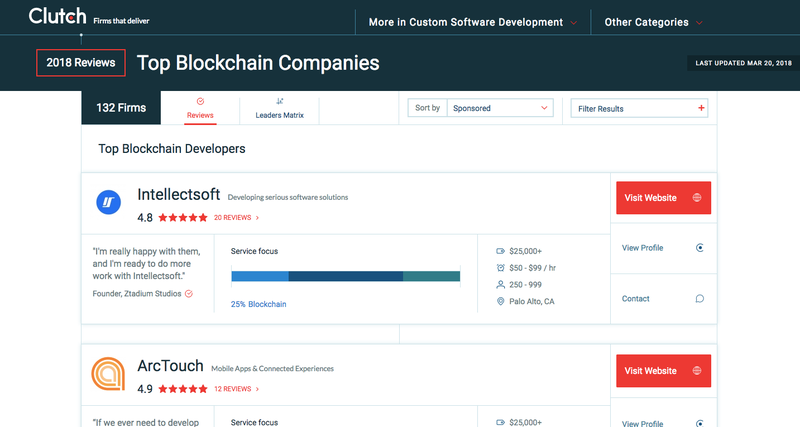 If you decide to look for blockchain developer companies in Google, you might be overwhelmed with the number of options and paid advertisement promising ‘top-tier specialists and reduced cost’. Yet, how can you know if the company really has the required expertise and can be trusted? In this regard, company listings such as clutch.co or goodfirms.co prove to be a useful source of information. There are 131 firms on clutch.co and 177 on goodfirms.co so far. So you have to be patient to look through the whole list until you decide to hire blockchain developer. However, the platforms offer verified customer reviews and independent company rating to help you make an informed decision before you sign the contract. Yet, hiring a blockchain development company also has a number of pitfalls you should take into account. First of all, most companies price their services higher, compared to independent developers because of the overheads and hidden costs associated with their in-house employees. Plus, you should be careful about the cooperation model and terms your provider offers. Make sure to pre-vet your potential providers with all due diligence before hiring developers. Talking about various hiring options, it is worth to mention one more blockchain developer talent pool. Cryptohire.io is a marketplace for hiring blockchain developers from top consulting firms. It’s a platform that combines the convenience and simplicity of freelance marketplace with the transparency and reliability of in-house staff. The 1,200 blockchain engineers listed on the website are pre-vetted and proven specialists, working as contractors for some of the leading consulting companies worldwide. Thus, you can interview and hire each candidate directly without the need to contract their firms. With Cryptohire you can hire individual developers as well as set up dedicated development teams. In any case, every developer you hire becomes a full-time member of your in-house team. The partner companies that offer blockchain developers for hire will take care of all administrative issues, from comfortable and well-equipped workplace to taxes, vacations, and training. With Cryptohire blockchain hiring will become way less time-consuming and stressful. The platform also uses smart contracts as an additional level of safety and as an option allows you to pay in any cryptocurrency you want. Taking into account the explosive growth of blockchain hiring, businesses need to act fast to secure the best talent the sooner the better. Browse hundreds of available developers, shortlist the best candidates, and start building your blockchain project in days, not weeks.